To make up for the lack of giveaway last week, while my husband was in hospital, I am doing several giveaways this week. I might just do one every day till our birthday celebration begins, when the bigger prizes come into play. We shall see how my time goes. Today's giveaway is “A Seat on the Aisle, Please! The Essential Guide to Urinary Tract Problems in Women,” by Elizabeth Kavaler, M.D. 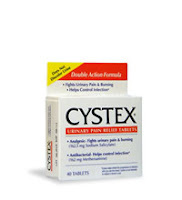 (Copernicus Books, 2006) and a 40 tablet box of Cystex: Urinary Pain Relief tablets - a total value of $40.00. Fortunately none of us had a need for this product, and I know it's kind of uncomfortable to talk about - but many women have had this problem at some point in their lives. So yeah, we are going to talk about it - for all those who've been distressed, isolated, and embarrassed for too long! Did you know that urinary tract infections (UTIs) account for 8.3 million doctor visits each year? “UTIs are considered the second most common infection in the body,” says Elizabeth Kavaler, M.D. While some women may diagnose themselves, a UTI requires both confirmation with a doctor’s diagnosis (urinalysis and/or urine culture) and a course of antibiotics to clear it up. However, it may take several days to get in to see your physician, and for the antibiotics to kick in. Cystex® is the only over-the-counter urinary pain reliever available with a dual-action formula that not only eases the pain and burning caused by a UTI, but also contains an antibacterial to help stop the progression of bacterial growth. In the course of a lifetime, more than half of all women will experience some form of debilitating pelvic disease or discomfort, including chronic urinary tract infections, various kinds of incontinence, pelvic floor prolapse, and interstitial cystitis. Surprisingly, until recently there has been only scant attention paid to this very common group of disorders, considering the vast population of sufferers. What's more, doctors have long tended to dismiss many symptoms of urinary tract disorders as an inevitable consequence of the aging process or, worse still, as indicators of underlying psychological disease. It’s no secret that women don’t like public restrooms: a recent survey conducted by Cystex® urinary relief tablets finds that 70% of women indicated they have walked out of a public restroom without using it because they felt it was “too dirty.” However, if you squat when you urinate in a public restroom to avoid an infection from the toilet seat, you might be surprised to learn that you may actually be doing more harm then good. According to Elizabeth Kavaler, M.D., squatting over the seat can actually prevent the complete emptying of the bladder, which can lead to infection, especially in women who are prone to urinary tract infections (UTIs). To help women better understand UTIs and how they can be avoided and treated, Dr. Kavaler is taking part in the new Cystex “Know Your Bladder Better” video series. Enjoy the videos and if you don’t see your topic addressed or have a question of your own, please feel free to Ask Dr. Kavaler a question about UTIs or bladder health by using their online submission form. To enter to win this book and Cystex, please leave a comment telling us something you learned while watching the videos? "Frugal-Freebies.com is having a great giveaway: “A Seat on the Aisle, Please! The Essential Guide to Urinary Tract Problems in Women,” and Cystex (Urinary Pain Relief tablets)! Stop by before midnight Sept 13th EST to enter to win! " Two weeks from posting. This giveaway ends on Sept 13/09. I will e-mail the winner, and results are always posted here on the following Monday as well. If the winner doesn't respond within four business days, with contact details, a new winner will be drawn. Announcing the winner! There were 65 entries, with one (1) winner. The winning number is #35 - MomUnion. Congratulations! Interesting video! I didn't realize women were so outnumbered by men in the field of urology! Glad there are some... I think a woman's POV on women's UTI issues might be more accurate. more than 8.3 million doctor visits a year are for a UTI! Interesting. Things we need to know. Thanks. Nice to know that UTI's don't do long term damage to my body! Great to know that having multiple UTI's won't do permanent damage to my body. I have been plagued by utis and bladder pain most of my life. This new product gives me hope. As a sufferer of utis and bladder pain most of my life, this new product gives me hope!!! I learned that (thank God) these are not harmful to my body. So what good is a urologist (just kidding!). I also learned that there are only around 500 female urologists in the nation. I wonder why? I have had quite a few Urinary Tract infections. I find this very interesting and I would like to try these pills out. I learned that 8.3 million visits to the doctor are for UTIs. I have a diagnosis of Interstitial Cystitis and am very interested in reading this book. Most doctor visits are for U tI's but they don't do long term damage to the body. I learned that UTI's are the second most frequent reason people visit the doctor. I learned that urinary infections are more common than I thought, and I'm not the only one getting them, and they sre not doing permanent damage to me. I learned how common UTI's are, especially in women. I learned that they don't do long term damage (Thank goodness) and that cranberry juice can do more harm than good if not taken at the very onset of the UTI. I found out about this giveaway through the giveaway round-up on Just a Mom's Take on Things. urinary infections are very common. i get them a lot myself. would love to win info. I never realized that so may (8.3 million) visits a year to the doctor are for UTI's. Wow, at least I'm not alone in this.8.3 million! I learned that, when using a public toilet, squatting (rather than sitting) is more likely to cause an infection because you can't empty your bladder completly. The uring left in the bladder can become infected. More than 8.3 million doctor visits a year are for a UTI.. I'd always heard that a UTI could damage your kidneys (if not treated right away). It's nice to know that's not really a danger. UTI are more common than I thought and thankfully they do not cause long term damage. Having multiple UTI's won't do permanent damage to my body. I never knew that. I get bladder infection all the time. I learned having multiple UTI's won't do permanent damage ! I shared this on facebook & sent a msg to my niece to enter. We both suffer from a backflow problem & right now she is really ill! found out about this giveaway thur online sweepstakes. I learned that it is worse to squat at a public toilet than to sit. I heard about this on Sweepstakes Advantage. I learned that there are only around 500 female urologists in the nation. I found out about this giveaway from another web page. I learned that having UTIs do not do long term body damage.